The Sequence Fill option is used to create a number sequence over a selection. The sequence can be forward, backward, single, double or higher increment, as a cycle, etc. The selection can be over one cell, a cell range in one or more columns, an entire column, or several entire columns. 1. In the Xsheet or the Timeline view, select a cell range. 2. If you are working in the Xsheet view, select Animation > Cell > Sequence Fill. Click the Sequence Fill button in the Xsheet View toolbar's extra buttons. 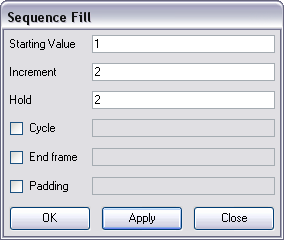 In Harmony Xsheet, select Selected > Sequence Fill. You can also click on the Sequence Fill button available in the Xsheet View toolbar's extra buttons. If you are working in the Timeline view, right-click and select Exposure > Sequence Fill. ‣ Press [Ctrl] + [M] (Windows) or [⌘] + [M] (Mac OS X). 3. In the Starting Value field, type the starting number for the number sequence. 4. In the Increment field, type the increment to which the number will change from frame to frame. (1-2-3-4, 1-3-5-7, 10-9-8-7-6-5-4-3-2-1). The value can be positive or negative. 6. Select the Cycle option if you want a cycle; type the number of cells for this cycle’s duration. If you choose a two cell hold, a cycle of three drawings will last for six cells. 7. If you selected a larger range than the amount of frames needed, select the End Frame option and type the last frame needed. 8. If you want to have more than one digit in your numbers such as “001” instead of “1”, select the Padding option and add as many pound signs (#) as digits needed. Also, you can type a letter or word in the field for it to be added in front of the drawing number.